In the world of coffeehouses, most shops look pretty much the same. What I mean is that right now most shops (especially in the same city) seem to use very similar layouts and themes. For all the shrinking the world is doing these days, it is still hard to find truly unique interiors. Of course certain staples like counters, tables and chairs tend to gravitate to a certain trendy uniformity, but it's surprising how many shops fail to set themselves apart with a rocking decor simply because they lack or leave out the creative process. But some places do their planning well and put together a memorable shop. 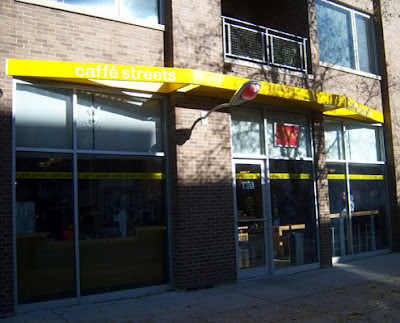 When I was last in Chicago, I found such a cafe in Caffe Streets. While the exterior didn't scream anything different than a normal coffeehouse would, the interior drew the eye (and eventually the rest of the body) in with its layers of wood, well-placed plants and its one-of-kind counter that boasted not only fine equipment, but also several street lights that loomed becomingly over the baristas. As for the coffee, they served me Los Andes of El Salvador, a single origin espresso from Heart Roasters out of Portland, and a pourover of El Trapiche Colombia from Intelligentsia. The espresso, pulled medium-short with a brown crema, issued notes of lime, powdered sugar, a cigar-like sweetness, butter cracker and balsamic vinegar amidst seaweed salad; a delicious extraction that enamored me with its bright front. The pourover tasted of condensed milk, clover honey, bits of grass, some merlot, vanilla and a smidgen of dandelion, overall smacking of a mellow cup of caffeinated nectar. Of course no stylish cafe is complete without great coffee, and Caffe Streets held the full package. If you're in the lovely city of Chicago, swing by to the only shop that offers street light both inside and out. his was a actually very great submit. In theory I’d wish to publish like this also - getting time and actual effort to make a terrific piece of writing… but what can I say… I procrastinate alot and by no means appear to obtain some thing done.